Peg board (Size is up to you. We used a leftover piece we had on hand). Nuts and bolts (We used 32 x 1" and they seemed to fit perfectly). The piece of peg board we had was white in color. If you have a piece that is brown or another color I suggest painting it white. 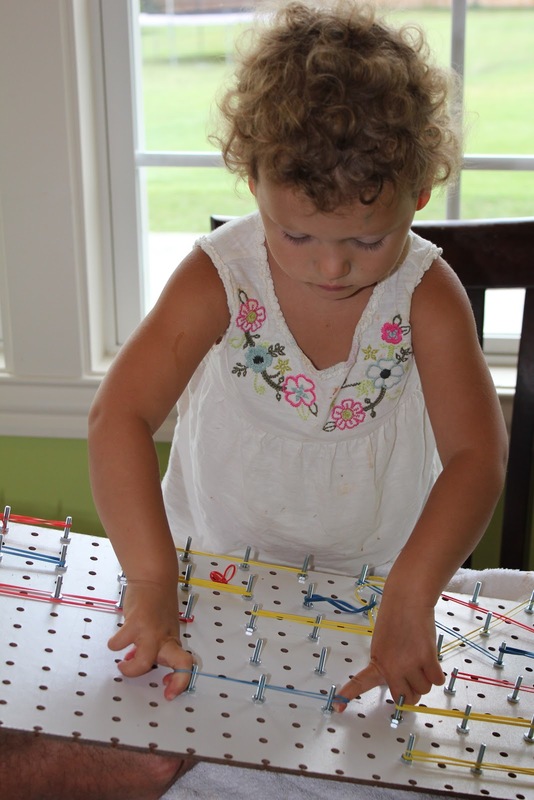 My daughter is using rubber bands here, however, I plan on giving my 16M old a go at this with some soft hair ties. I also skipped every other hole when putting the bolts in. A geo-board has been on my list for a while now for when my son is a bit older and more developed in his fine motor skills. I think they look wonderfully engaging. I really do have to wait though. I think if I introduce it too early he will become quite frustrated with the activity. I'm seeing this in a larger size as an awesome center in my elementary art classroom! I've had geoboards on my mind for a while now, but I like this idea much better: cheaper, less time to make, and doing it on a large scale will promote teamwork, sharing, etc! Thanks for the idea! Hello! How old is your daughter here?